At the time of Louise Bourgeois’ death in May 2010 a question mark hung over where one of the artist’s largest, most ambitious works would end up. I Do, I Undo, I Redo, an installation consisting of three 9m-tall steel towers that visitors could climb, created for the inaugural Tate Modern Turbine Hall exhibition exactly a decade earlier, had been packed away in storage since it was taken down. In the year before Bourgeois’ death, Irish property developer and businessman Patrick McKillen went to visit her in New York to propose transporting the towers to her native France and installing them at McKillen’s 600-acre estate Château La Coste, an organic winery and expansive art and architecture park in the heart of Provence. McKillen was already well acquainted with Bourgeois’ long-time assistant Jerry Gorovoy, having bought a Crouching Spider – the first in a series of six and the only one in France – for Château La Coste some years earlier. You are greeted by the giant arachnoid sculpture rising from the reflecting pool in front of the Tadao Ando-designed Art Centre (housing the main reception and a restaurant) when you first enter the estate, which McKillen opened to the public in 2011. It was McKillen’s radical idea of installing the piece on the water that sold the deal to Bourgeois. Given she had been so happy with the idea, McKillen felt empowered to suggest another. Bourgeois died before the deal to bring I Do, I Undo, I Redo to La Coste was sealed. ‘After that, Jerry thought the estate would want it to go to the highest bidder, which meant it was way out of my reach,’ says McKillen. It was only after Bourgeois’ children saw the footage of their mother talking to Nouvel about the project, some months later, that Gorovoy called McKillen to tell him they had changed their minds. Patrick McKillen – Paddy to his friends – is recounting this story sitting at what will be any art and food aficionado’s most coveted dining table. It is an intimate setting directly under another Bourgeois work McKillen acquired for La Coste, The Couple, 2007-2009. The polished aluminium piece hangs in the centre of a glass pavilion that echoes Philip Johnson’s Glass House in Connecticut. Designed with The Couple in mind, it will house the fine dining restaurant at the new Villa La Coste, a luxury hotel launching on the Château La Coste estate comprising 28 villas. The hotel has been under construction for the duration of 2016 and is located close to the site that Nouvel earmarked for the towers, which are halfway through being installed. At present, hotel guests will get a unique view of Bourgeois’ I Do, I Undo, I Redo before the hill-shaped roof goes in next year. Gérald Passédat will be at the helm of the Pavilion restaurant. It will be the first restaurant outside Marseille for the Michelin-starred chef, who owns the clifftop hotel Le Petit Nice. Passédat is celebrated for cooking inspired by the sea, but at the Pavilion he will follow in the spirit of La Coste – as the architects and artists invited to create installations do – and take inspiration from the Provençal countryside. ‘It is something different for me,’ says Passédat. ‘Rather than looking out to sea, I am searching for the finest ingredients from the land. It is going to be unique.’ McKillen conceived the design of Villa La Coste in collaboration with his in-house architects and the Marseille-based Irish architect Christopher Green. It is a simple, clean, elongated silhouette that blends discreetly into the landscape. Looking up from the Tadao Ando Art Centre, you could easily mistake the convex stone facade of Villa La Coste for another pavilion or site-specific installation. André Fu was appointed to work on specific interior elements – the spa, the bar, the library and the Pavilion restaurant. ‘It is a remarkable project to be part of,’ says Fu. 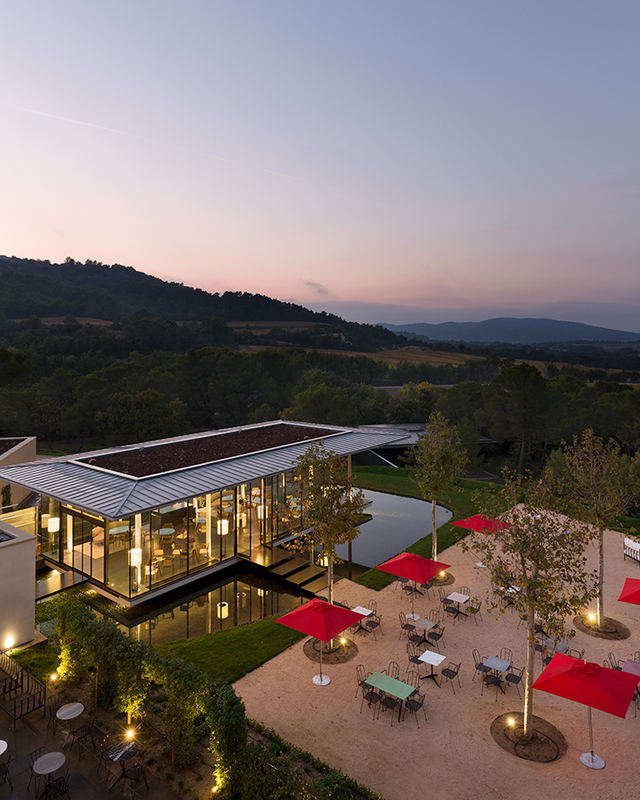 ‘Château La Coste is home to projects from the likes of Tadao Ando, Frank Gehry, Jean Nouvel and Renzo Piano. Paddy has access to just about any architect in the world. It is a huge privilege to be here. ‘La Coste has a very special atmosphere,’ Fu adds. A new road has been laid to take guests up the hill to Villa La Coste; it winds past the property’s Syrah, Cabernet Sauvignon and Vermentino vineyards (the estate produces some of the region’s finest organic wines through biodynamic practice). 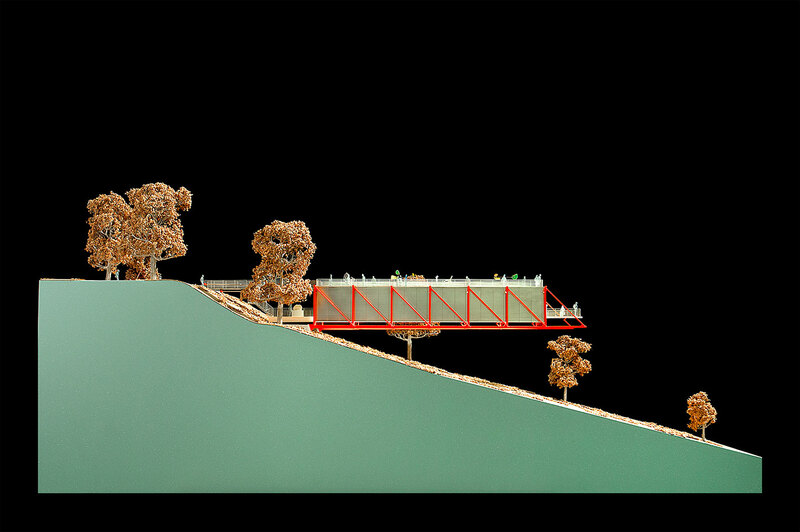 Look left on the way up and you’ll see Frank Gehry’s wooden and glass music pavilion, commissioned for the Serpentine Galleries but funded by and intended for Château La Coste. The estate undertakes outreach work with local schools, inviting them to use the pavilion for performances and lectures, and impromptu concerts by visitors often take place here. Look right on the way up and you can make out the path to Paul (grandson of Henri) Matisse’s aluminium Meditation Bell. There is a more scenic walking route through the forest, where you pass Sean Scully’s stacked stone sculpture, weave through Richard Serra’s steel sheets and have the option of wandering further to take in Liam Gillick’s moving coloured screens, Lee Ufan’s chapel-like space, Andy Goldsworthy’s giant nest and the only architectural installation Tracey Emin has ever produced: an elevated wooden walkway leading to a wine barrel containing a ghostly porcelain cat. 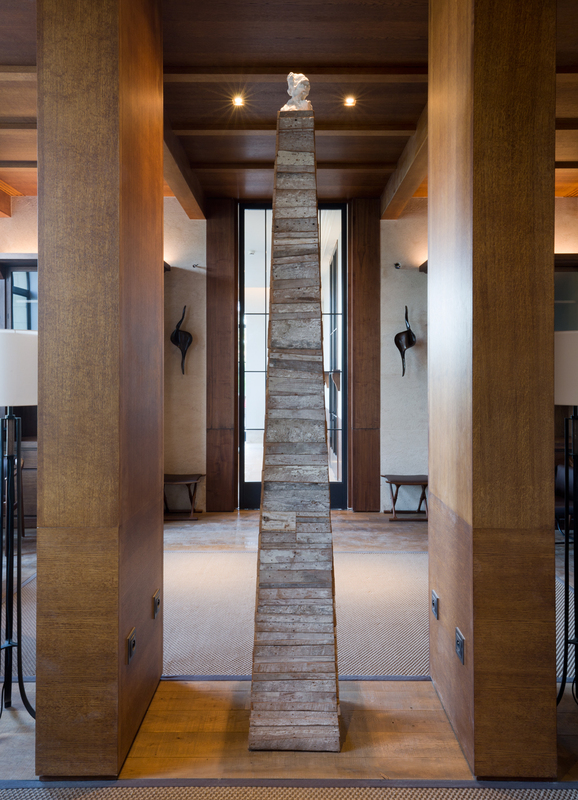 Once you arrive at the hotel you are surrounded by artworks from McKillen’s personal collection. On one wall in the lobby, pages from Bourgeois’ embroidered fabric book Ode à la Bièvre hang above a Charlotte Perriand table, with a Ron Arad ‘Rover’ chair to the side of it. The room’s centrepiece is a banquet-size wooden table by Nouvel with a polished stainless steel Tom Shannon sculpture on top (Shannon also has a large work in the park). 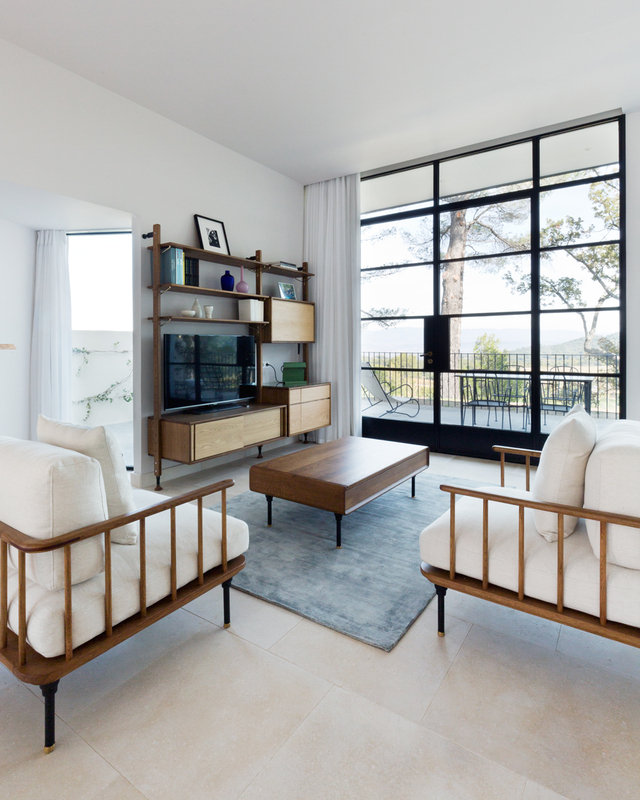 Pierre Yovanovitch chairs, a Jean Royère sofa, and chairs designed by McKillen are arranged around the room. Behind the check-in area is a series of Alberto Giacometti sketches that had been in a vault for 40 years, while opposite is a David Douglas Duncan photo of Picasso in an Indian headdress (McKillen owns a selection of the photographer’s archive). Elsewhere in the hotel there are Leger tapestries that came from the Seagram Building and a stained glass window based on the first Henri Matisse drawing McKillen acquired. 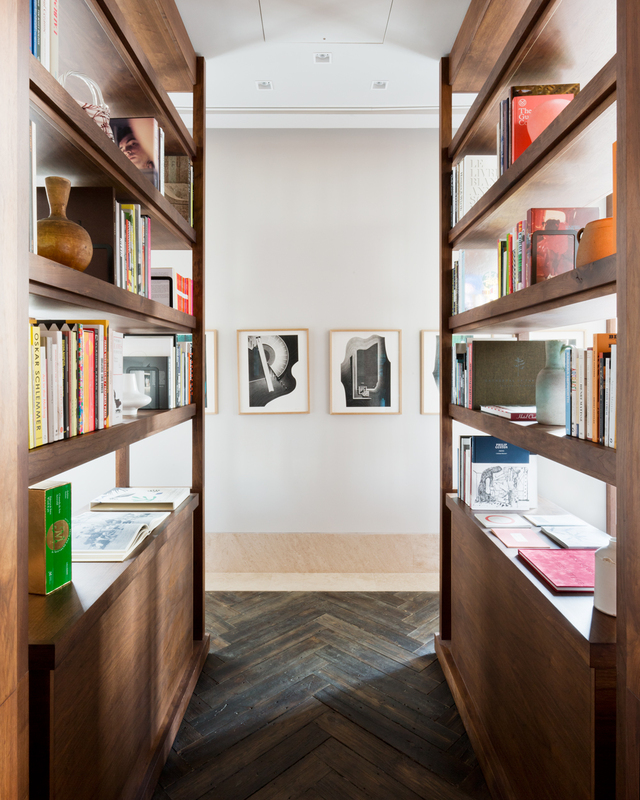 In every guest room there are further artworks on display (Hiroshi Sugimoto, more Bourgeois, Tracey Emin and Bernard Frize) as well as photographs of the artists and architects who have contributed to the estate, with pictures of them in situ while at work. The décor in the rooms is elegant and functional, with McKillen calling on Vietnamese design company District Eight (see W*205) to provide shelving, tables and chairs. McKillen, who has interests in some of the best hotel properties in the world, especially in London – Claridge’s, The Connaught, The Berkeley – has project managed Villa La Coste himself. He is here every weekend overseeing all the elements, right down to the teapots you’ll pour from at breakfast and the books on the shelves in the rooms. His sister Mara, who has lived in Aix-en-Provence since 1990 and who discovered the historic estate for sale back in 2002, is heavily involved too. It is very much a family affair and McKillen has a long-serving and loyal team. His construction manager David Magill and surveyor Mark Allen have worked with him for years. ‘I like to keep the team small. I always say “don’t employ more than 11 because Jesus couldn’t handle 12”,’ he says, laughing. McKillen is thoughtful and self-effacing; yet the passion and drive he dedicates to the ever-expanding project at Château La Coste is evident. While the hotel is receiving its finishing touches, his team is breaking ground on a number of new installations on the estate – one from Ai Weiwei, a collaboration between Tony Berlant and Frank Gehry, and three new museum buildings by Renzo Piano, Richard Rogers and Oscar Niemeyer. The Niemeyer design was signed off literally days before he died in 2012. Then there is the ‘mini Roden Crater that James Turrell has submitted,’ McKillen says nonchalantly. ‘Fabrication is all done – we just need to do the excavation work to install it. We should have it done by next spring. It makes sense to get that done while the big machinery is on site.’ Magill, sitting opposite McKillen, looks a little alarmed. Some installations change track because McKillen is keen to try not to touch a tree on the estate. ‘We protect them as though they were children,’ he says. But this deeply personal project also has to make commercial sense. McKillen will make certain it is a self-sufficient business, if only to protect his own children. ‘The worrying thing for nutcases like me is what happens if I get hit by a bus tomorrow,’ says McKillen. ‘I don’t want this to be a folly or burden for those left behind – Château La Coste has to sustain itself and feed the future. The winery and now the hotel has been set up to do exactly that.